Costco is, of course, the go-to place for folks looking to buy massive quantities of paper towels, canned goods, and Cheez-Its -- in addition to its its quality cheap booze and glorious cheese wedding cakes. Evidently, it's also the place to buy physically massive crustaceans, because certain locations of the bulk goods chain have been spotted selling gargantuan lobster claws, with some tipping the scales at a whopping three pounds. Although lobsters tend to vary in size depending on age and where they're found, the specimens being sold at various Costco locations around the country may be among the biggest you'll ever lay your eyes on. Some awestruck shoppers have been sharing photos of the curiously huge claws on social media, including one three-pounder that's so big it requires two hands to hold. For comparison, average sized lobsters weigh a bit over a pound (or more if they're large), which means the full weight of the guys these are coming from must have be closer to 12 or more pounds. Before you hightail it to Costco to stock up, it's important to note that the massive claws have evidently only been spotted in Costcos on the West Coast; specifically, in northern and southern California. Though according to some Reddit users, they've been spotted at locations in those areas since as far back as mid-January. 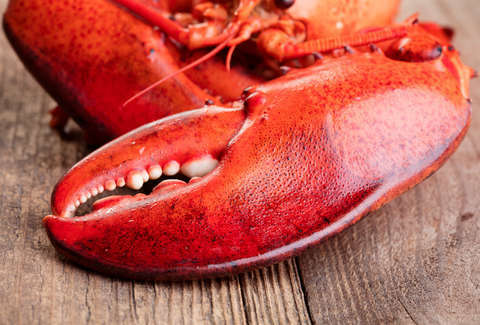 As for where they came from originally, it's unclear, though according to FoodBeast, roughly 1% of lobsters shipped from Canada can weigh around 15 pounds. Then again, as fun as it might be to dream about devouring a monster claw dipped in a bucket of butter, it's hard to tell just how much of the weight is coming from the shell itself.